Is it already Friday? Well, time passes by so quickly sometimes, we don't even notice it. All of a sudden, we only have a few more hours left to finish important stuff before the weekend. Or to prepare ourselves accordingly for something important. The Dwarves are used to deadlines. Are you, too? But before we come back to deadlines, let's talk about some interesting community-created content we spotted throughout the week. With Update 72, we reworked the Drone Force One. Both visually and stats-wise. While the stats were changed simply due to balance reasons and to tackle the poor performance of the unit, the visual overhaul turned the former spaceship into the Harbinger of the Slither Lords, a Snake Spirit, and Herald of Apep. You, our community, reacted differently to said changes. Some players even miss the old Drone Force One so much, they wish the unit would still be available separately, even more so than more deck slots, eventually. 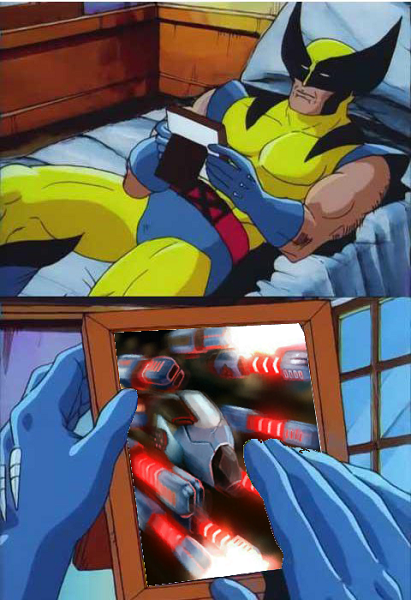 An active Redditor of our community, u/E-308, made the picture above to reflect these feelings of some players. He made sure to especially mention raqyee and Vango, while there are surely more. That's a nice gesture if he wouldn't have forgotten about a very specific detail! At this point everyone knows that I ONLY wear white cotton gloves when handling my DFO pictures collection! Vango felt really offended by that little detail. And honestly, who wouldn't use white cotton gloves for their Drone Force One pictures collection? What happens when Quality Assurance masochists (aka Bug Busters) try to be creative instead of busting bugs? Well, if that QA masochist is a can of Sprite, the outcome is very unpredictable. The crime scene was Reddit once again, but this time it wasn't the community publishing a piece of art, but our newest Dwarf That Sprite himself. Under the headline Troubadour Model Rework, That Sprite presented his very best attempt in creativity so far. In the video above, he presented his ideas of a Troubadour rework. We don't want to tell you anything more about this but invite you to see for yourself! Thanks to That Sprite, our bug buster with a special sense for creativity. ...the deadline for sign-ups and deck submissions for King Puff Cup 24 is due. And for you, Masters, that means to hurry up! King Puff Cup 24 is scheduled for Saturday, June 28th at 13:00 UTC and planned to be run with the Conquest format. Wild cards are banned, as usual. No additional card bans. But something new will happen tomorrow live on stream, anyway. It came to our ears, that the community loves giveaways. It also came to our ears, that the community likes streams with giveaways. We heard you! BetaDwarf's Community Manager Erythais will personally giveaway in-game codes for various goodies during every following King Puff Cup stream & the giveaways will grow as the tournament goes on. All you have to do is to be a) in the Twitch chat of the official King Puff Cup Twitch channel during King Puff Cup 24 and b) talkative. Talkative, as in "getting in touch with the community". What will happen is that in the background, Erythais lets a bot roll every now and then with all active viewer aliases. The alias which is taken gets an in-game code from Erythais in a private message on Twitch and is removed from further rolls. With the beginning of game 1 of the final stage, all active users will be added to the bot's pool again. That means you have the chance to win 2 different in-game codes if you watch King Puff Cup's group & final stage! Enough talk, watch the clock! Check the official announcement on Reddit with all the necessary information for you to sign-up in time until today, 13:00 UTC. That's all for today, Masters! We wish every participant and viewer of Saturday's King Puff Cup 24 good luck & tons of fun with the action on the flying arenas, presented live by the King Puff Cup staff. On a sidenote: That Sprite's idea for a Troubadour rework was rejected and no Puffs got hurt in the process!